It’s pretty clear that owner and wine buyer for The Daily Drinker, Caspar Bowes, just can’t help himself. Just take a look at all of the wines on offer, each personally chosen and reviewed very honestly by Caspar, and you will see immediately that this is a business that does not just pay lip-service to offering something different – something that’s a real alternative to the High Street – but which lives and breathes it. 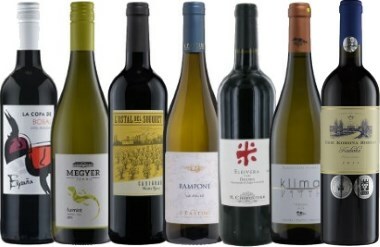 Every time I review a selection of wines from them I have to add new grape varieties, often new wine regions, to my extensive database: Caspar loves his Kadarka, his Minutolo and his Vidiano, and it is just wonderful to have such an enthusiast making these wines available to the UK’s wine lovers. Anyone can buy from The Daily Drinker, but you are encouraged to join the Daily Drinker club where you can sign-up to receive as few as two bottles per month, with free delivery, and still benefit from 10% off their already competitive pricing. It’s an innovative take on the ‘Wine of the Month’ club, and very different from some of the biggest players in the UK who operate such schemes. I’ve been receiving their monthly selections for the past few months, so thought I’d gather a few tasting notes here. (2016) From an estate under the same ownership as Château Clinet in Pomerol, and from clay and volcanic soils, this is a fragrant example of the dry Tokaji style, more aromatic and lifted than some with floral notes and nuances of peach, as well as fresh green herbs and lemon zest. A vibrant and tangy palate too, not as rigorous as the Dry Furmint 2015 from Disznoko for example, but with a little more 'prettiness' and delicacy. Another lovely wine from Megyer to follow their fine 2013. £11.70 for Daily Drinker club members. Watch the video for more information and food matching ideas. (2016) For a long time in Puglia the wines made from the Fiano Minutolo variety were labelled as 'Fiano', and yet were intensely aromatic and very different from the Fiano of Avellino. In fact it now appears the two varieties are unrelated, and this is a good example of what's now generally known simply as 'Minutolo'. Almost Gewurtz- or Torrontés-like, it is headily aromatic. Complex, juicy and dry with fantastic grip and tang, long and packed with flavour and personality. (2016) Greece produces some masterful crisp white wines, often with salty tang of seashell minerality allied to excellent fruit, and this example from the island of Crete does not disappoint. Gently fragrant with straw, herbs and nuts over citrus and stone fruits, the palate is really quite weighty and textured, a full and grippy style of wine with fruit skin notes (melon, citrus) a fair bit of almost peachy fat and sweetness, then that pithy and saline streak of minerals into the finish. A powerful wine, at its best with meatier, white-fleshed fish perhaps. (2016) Bobal is a very widely planted grape variety here in Spain, but often confined to fairly rustic local wines. This is a bit different, the nose vinous (black fruits, a touch of spice) but the palate surprisingly smooth and fresh, a hugely juicy character, the tart skins of plums and cherries, then the sweet flesh too, a grip of tannin is there just to give a bit of definition and the dry, savoury but fruity finish makes it widely mid-week food friendly. Only £7.20 to Daily Drinker members. (2016) Made from 50-year-old Carignan vineyards in the Languedoc, this taut, black-fruited wine has some spice and some intense, plum-skinny aromas, a little note of coal dust and an altogether inky personality. In the mouth the natural liquorice concentration of these old, unirrigated bush vines is at the core of this wine, grippy with tannin and with plenty of acid bite, but the juicy, intense and really quite ripe black fruit is there too. A chewy and slightly rustic southern French red, crying out for some cassoulet or maybe confit duck. (2016) Eger is a town in northeast Hungary, most famous as the home of 'Bull's Blood', perhaps the only famous wine of Hungary outside of Tokaji. This is made from Kadarka, one of the grape varieties found in the Bull's Blood traditional blend. It's an expressive. modern take on the style, perfumed and aromatic with some violet and kirsch lift to the aromas, though it is a touch volatile too, a note some will like more than others. In the mouth it is dry, a touch of bittersweet chocolate against the cherry fruit, and it does have tang and juiciness. £12.15 for Daily Drinker members.